Nicholas Parsons explores his life-long enthusiasm for clocks when he goes in search of the most valuable and famous watch in the world - the so-called Marie Antoinette. 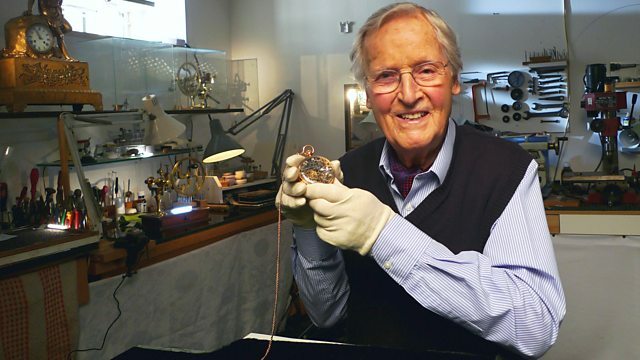 Nicholas Parsons, Just a Minute host and stalwart of the entertainment world, explores his life-long enthusiasm for clocks when he goes in search of the most valuable and famous watch in the world. The so-called Marie Antoinette, once the target of one of the biggest museum heists in history, was the masterpiece made by 18th-century genius Nicholas Breguet for that doomed queen. Tracing the enthralling story of Breguet's rise to fame, Parsons visits Paris and Versailles, and the vaults of today's multimillion-pound Breguet business. Exploring the innovative and dazzling work of the master watchmaker, Parsons unravels the mystery behind the creation of his most precious and most brilliant work. Parsons then heads to Israel to discover how, in the 1980s, the world's most expensive watch was stolen in a daring heist and went missing for over 20 years. Revealing a little-known side of one of our favourite TV and radio hosts, the film offers a glimpse into Parsons's own private clock collection while also telling an enthralling tale of scientific invention, doomed decadence and daring robbery. The most compelling stories from world history on BBC Four.